This customer has a network of radio base stations nationwide. Each site has communications equipment with serial, Ethernet, digital interfaces, door access control, tower light monitoring, analogue inputs for measuring temperature and environmental parameters such as smoke, digital outputs for opening doors and turning on/off power units, Ethernet for CCTV, serial and DI/DO for controlling generators, and analogue inputs for measuring power voltages. The client chose the GW9000 Series router as it is a single device capable of supporting custom applications that can tie together discrete inputs, analogue inputs and control inputs to provide semi- or fully-automated maintenance routines. 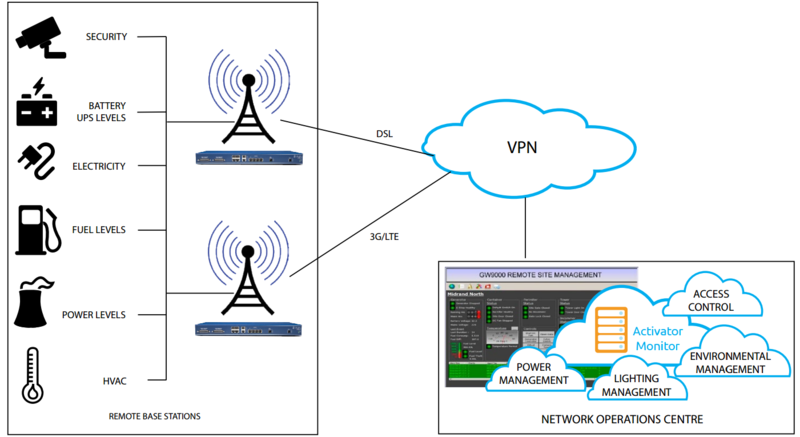 Its scripting capability provides access to equipment that previously required local access via serial ports. A single central management system was provided to control the remote site equipment such as generators, door access, CCTV, monitoring battery levels, turn on/off conditioning and so on. Activator was used to automatically provision the router and provides centralised access to router connectivity status with email alerting, network utilisation statistics and diagnostic information.